How long have you been quilting? I began quilting in the late 70's so that makes it about 40 years. What made you decide on this pattern? 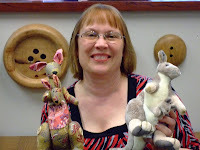 I was reading the First edition of the book, Stories in the Stitches at the same time I had volunteered to make a raffle quilt for Wisconsin Quilters Inc., the statewide quilt guild. I fell in love with the original quilt because it was a very artistic piece with an unusual layout and the color combination was spectacular. I felt compelled to make my interpretation of it. How long did it take to make this/how long did it take Mary Besau Leanna to make this do you think? I had a year to make and deliver the raffle quilt. I did most of the work in 4 months after I finishing the plan and finding the fabrics. I did the layout on graph paper to keep the proportions correct and hand drew all the floral pieces. I changed some of the elements to suit my style rather than simply copying all of them. I would imagine that it also took Mary Besau Leanna a year or more to create her quilt. What (if any) are the main differences between your two quilts? Mary's quilt was entirely made by hand, needle turning the edges of the appliqué patches as she laid them on the top with tiny hand stitches. My quilt has the appliqués fused to the top and every edge was stitched by machine using a tiny zig zag stitch. I made each section separately and then machine stitched the pieces together. The sections of Mary's quilt were stitched together by hand because the sewing machine was not invented until after the Civil War in the 1860's. The quilting stitches which hold the layers together are done by hand on Mary's quilt and on the contemporary version the quilting was hand guided and moved under the needle of the sewing machine by a very skilled quilter, Penny Gerds on her household sewing machine. Do you prefer to quilt designs in a historical fashion or more contemporary? I really enjoy making traditional quilts and I plan to reproduce another historical quilt that I saw pictured in a magazine. I am inspired by the fabric and the colors. To beginning quilter's and quilter's to be (like myself), what advice would you give them to help them start this great hobby? I suggest that anyone beginning to sew or quilt should take a class and get a good reference book for help and then just start making things to see what you like to do. 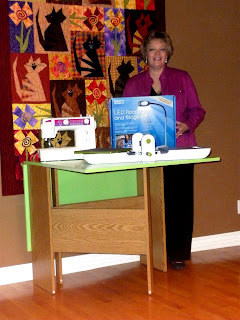 Also having a good sewing machine will make the experience easier and more enjoyable. 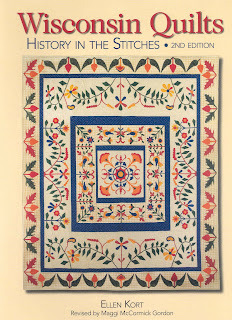 The book was written with material collected over a 15 year span by the Wisconsin Quilt History Project and published by KP Publishers, a Wisconsin company in 2008. 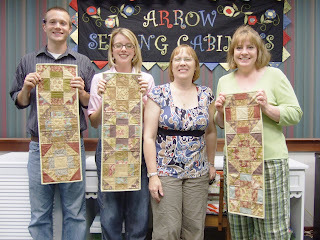 Proceeds from the sales go to help build the Wisconsin Museum of Quilts and Textiles in Cedarburg, Wisconsin. 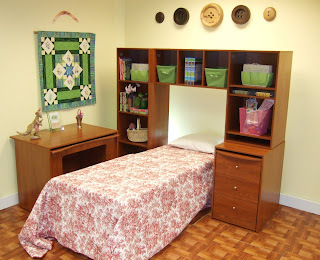 www.wiquiltmuseum.com. Copies of the book for purchase can be found at Amazon.com. This last weekend was Halloween, the one day a year where you can dress in any outfit imaginable and still fit in. This year Hether had a little custom party at her house and it was a blast. The setting was perfect, an old three story victorian styled house on a cold dark night in Wisconsin. The outside was secured by ravens and mummies and the inside was riddled with spiders and ghosts. As you walked through the entrance you were greeted by the hosts Morticia (Hether) and Gomez. There was food and drinks, group Pictionary, Wii bowling and scary decorations. There were all sorts of customs, all very creative and well planned: Bob Marley and a Titanic non-survivor; M&M (Jo) with rowdy Sailor; 80's couple (Phil). Even the dogs were dressed up, Puglsey and Wednesday, to match our hosts. One of the coolest things was the cake. It was made by the local baker and it was a fake dead blackbird with red cake in the middle. It was very delicious as well, but it turned your mouth green from the black frosting. Our friend Bonnie sewed her own costume, she was a maid. It was very well done and congrats go out to her for being so creative. Her partner came as a blind referee, hilarious. We didn't even think about it but we should have had a contest on best costume. Which costume do you like the best? Our guests did a great job preparing the party. One of the funniest decorations was the motion sensing, rocking picture frame that cackled at you when walked by it. It scared anyone who dared to go in front of it. It looked so realistic to which made it even funnier, because you would look at it real close and then it would go off. I can't tell you how many people almost ran out of the room in fright. Too funny. Send comments of which costumes were the best and if you had any interesting costumes of your own. Looking for a Holiday gift for someone close to you? Is this person a sewing enthusiast and already has a sewing machine? Ask yourself, does this person have an adequate place to put their machine or accessories? We might have something for you. Arrow Cabinets is having a sale on all of its cabinets (including Kangaroo) from November 11th through December 23rd. 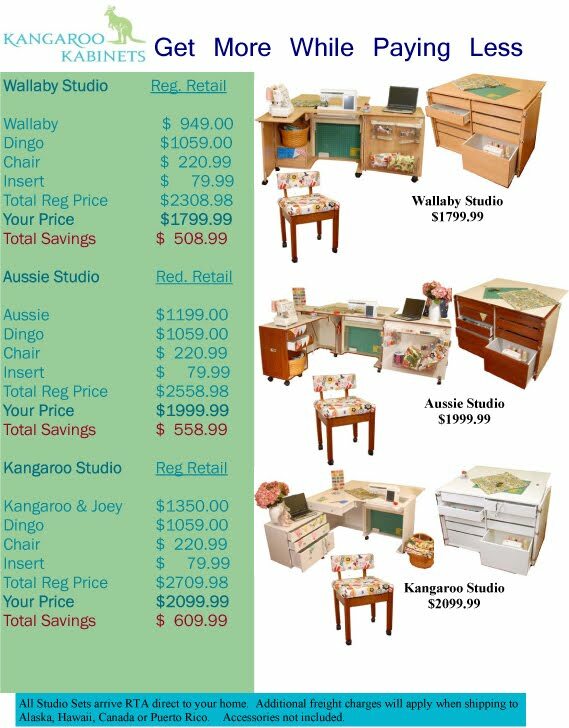 Our brick and mortar dealers (excludes internet dealers) will be offering these cabinets at prices lower than they have been all year. This is by far the best chance to buy. Now you might say "Well I don't want to have to find a store and shop for what cabinet to buy, then have to put it together before the holidays." I also have an answer for that. Find our list of internet dealers at our website and look at Kangaroo Kabinets. 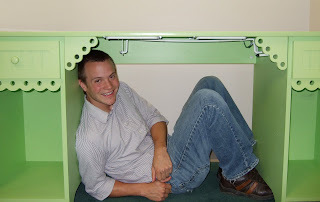 We offer to ship your cabinet fully assembled to any room in your house. How easy is that? 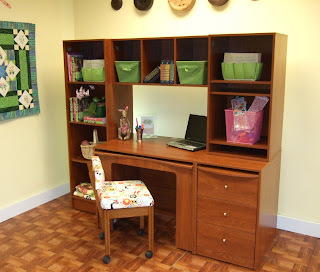 Just click, wait 2-3 weeks and presto... you have a sewing room ready to go! That might quite possibly be the easiest present you ever bought. Oh and guys, I'll tell you a little secret. You can also put your new flatscreen T.V. you got as a present on the cabinet when it is not being used! Its win, win. Just be sure to move it before you start sewing, otherwise you will end up with a broken T.V. 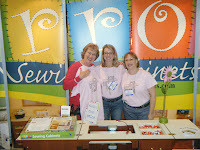 So we returned from International Quilt Market last week in Houston and it was just as fun as years past. Our fun little giveaway this year was the cool Arrow/Kangaroo pink t-shirts that had a picture of a treddle sewing machine on the front and "You Sew Girl" or "Its Hip to Hem" on the back. We couldn't have gone through them any faster. Then on top of a free t-shirt, we walked the show every hour and picked a lucky contestant who was wearing the shirt and they won a nice little sewing accessory to go with their machines. We had people circling the booths like sharks around prey. 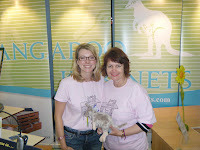 You can see a picture of the t-shirt worn by Hether with a nice Australian lady, holding the "kangy", we met who just loved the Kangaroo Kabinets. She wasn't the only one to drool over some of the cabinets we had brought. I can't tell you how many people went crazy over our green Olivia cabinet, which we had front and center for everyone to see. You could actually take a pin to every person's thought bubble as they walked by imagining themselves sewing in Olivia, it was so funny. We also had a guest appearance by a certain Eleanor Burns, author of Victory Quilts and T.V. show host "Quilt in a Day." It was very cool. We had to get a pic with her just to prove that met her. She even lucked out and got one of our cool shirts. Unfortunately I had to take the picture so I'm not in it, Hether and Jo are though and you can see how star-struck they are. 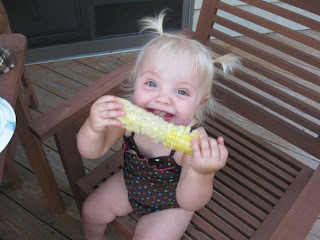 Come on we live in Wisconsin, besides Tony Romo every now and again, there are no celebs by us. Overall we had a great show and a fun time. I love coming to Houston everytime I go, even though we never saw the sun once because of the clouds. Next year be prepared because we will be armed with more t-shirts and we'll be slinging them out a passer byers like peanuts at a baseball game. Stop in a say hello. This is the first purse she knitted. She used a flexible hard plastic to keep the shape. FYI, it holds two bottles of wine perfectly! First Place. This is one of my favorites, if you look closely you'll notice that each little piece is a plastic grocery bag that was knitted together to make a large bag. Going green, I love it. This purse was felted with a really neat flower pattern on the inside. Lastly, the Grand Champion article... the Quilt. This quilt took her over 9 months of solid work to perfect. It took the home the number Ribbon of the whole fair! How cool is that. This isn't sewing or furniture related but I don't know if you overheard the big news (well its big news in Wisconsin), Brett Favre is now a Viking! This is the ultimate disrespect for any cheese head. A treachery of this magnitude hasn't been felt since Benedict Arnold betrayed our fledgling country to the British. For any fellow Favre haters out there please comment with any jokes or pictures of your favre dart board and win a nice little prize from Arrow Cabinets. "Brett Favre signed with the Vikings today. He looks forward to retiring a 4th time"
Hether, Alisha and I finally finished our quilt runners last week and surprising (especially for me) they all turned out really well. Jo was our teacher and she did a great job. Take a look at our great little quilts. For all three of us this was the first time we had quilted and we were a little green around the gills. Jo, who has years of quilting experience, gave us a little history of quilts and why/how they were made. We spent 30-60 minutes each day piecing our quilts together under the guidance of Jo, who had us do a lot more seam ripping than we all would have liked :) But it was necessary. After a few weeks we sewed our last stitch and we were finished. We all gave a sigh of relief at the end, but now I kind of miss that half hour a day of getting away from calls and emails. Shhh don't tell anyone. Hopefully we can do this again. stole what we could of Phil's--so all in all we now have some pieces we love. Can't wait to keep going and see how this turns out! We are on week 2 of our quilting class with Jo. I now finally understand why quilters need so many rulers.... and thank God for the person who invented the rotary cutter! By the way I am a really bad rotary cutter (secretly I have been pawning the cutting off on the others! "Is that my phone? Jo can you finish that up." 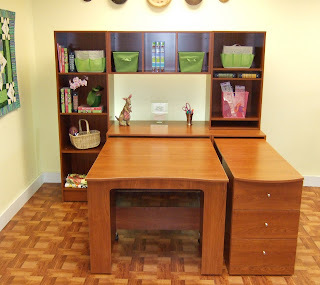 :) We have used our Pixie table and the top of the Dingo for all our cutting and spreading out. We have used Fiskars mats, Arrow mats and Fiskars scissors and rotary cutters. 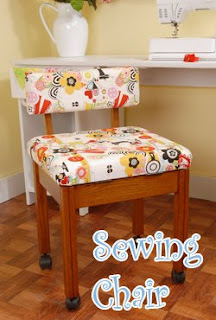 Sewing has taken place on our Gidget table. All great tools to have. It certainly gives you an appreciation for all those ladies years ago cutting with regular scissors all the squares and triangles needed, not to mention hand sewing the whole thing together! I will cherish my grandmother's quilts more and stop letting the dogs sleep on them after this class that is for sure! Lastly Alisha and I both learned not to be so greedy. I bought a layer cake from Moda for us to cut up and make our small table runner quilts. What is great about the layer cake is all the fabric coordinates, what is bad is Alisha and I loved every piece. We left poor Phil with all the solids and what we considered the uglier fabric, what man wants a quilt any way...right? Well in the end when we laid our quilts out before sewing, Phil's was awesome because he had far more contrast in fabric. Thus Alisha and I had to go back and cut more solid pieces to make ours not look so patterned. One could spend hours moving squares here and there, inside and out. Hey everyone its been a long time since our last blog, but man has it been busy for us. Kangaroo Kabinets are taking off faster each day. Our poor builders are working overtime to get them ready to ship. We have had some extra time to do a little crafty quilting project together however. Hether, Alisha and I are quilting our own table runners and they are really looking good... even mine :). Check these out! Between Hether, Alisha and Phil can you guess who is making which one? Guess correctly and we'll mail you an Arrow craft bag. Hello from Arrow Cabinets to all our fellow sewing bloggers! Just a reminder to finish up those last-minute Memorial Day quilts or projects. We just received our new sewing chairs in and wow are they flying out the door! If you have yet to see this new fabulous creation I have attached a pic to show you. Is'nt the fabric unlike anything you've seen? Brightly patterned, fashionable but with a retro look, which I love. And its comfortable as well, the ergonomics is great--try one yourself! 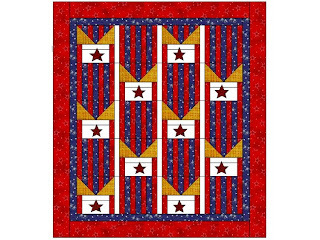 Have a wonderful Memorial Day weekend and as always, Happy Quilting! smugly. "Well, I have no memory problems at all, knock wood. "She raps the table. There was an elderly lady whom was waiting in the waiting room with her daughter.The nurse entered the waiting area and announced for the elderly lady to go on back to see the doctor. The nurse spoke louder but still she could not hear. The elderly lady's daughter leaned over and said, "mother let's turn your hearing aid up." Then she yelled in shock,"That's not your hearing aid, its a suppository! The elderly mother replied,"Well, now I know where my hearing aid went! A state trooper pulled a car over and told the man driving that he was going 50 mph in a 40 mph zone. "I was only going 40!" the driver protested. "Not according to my radar," the trooper said. "Yes, I was!" the man shouted back. "No you weren't!" the trooper said. With that, the man's wife leaned toward the window and said, 'Officer, I should warn you not to argue with my husband when he's been drinking."